Bankwell cottage is a real gem and due to the success of its sister Sunnybeck, it won't disappoint! The cottage is spacious with 3 large double beds (twin room and 2 double bedrooms). The cottage is close to the village just a 5 min stroll and Settle a 15 min walk away. Set in a row of pretty cottages it benefits from a private courtyard rear garden, lovely front garden, off street parking and a secure bike store. This offers the opportunity to relax and unwind or explore the Yorkshire Dales either on foot or cycle. Settle to Carlisle railway is close by with regular trains to Leeds. The cottage has internet access and towels and bedding are all included. The market town of Settle has many good pubs and restaurants and also Skipton is a 25 min drive away. There is so much to explore! If you fancy a round of golf the municipal course is on your doorstep and for the younger visitors, there are plenty of parks and playgrounds and of course ducks to feed. A perfect base! Bankwell cottage was purchased in 2010 and I decided to refurbish the cottage for holiday let in 2011 due to the success of Sunnybeck cottage. Giggleswick is a chocolate box village with 2 lovely pubs, a Tuck Shop, church and the famous Giggleswick School with its beautiful chapel. The whole area is stunning and a complete switch off from busy life. If you don't fancy walking the three peaks you can visit many of the local towns and villages close by or take the steam train from Settle to Carlisle. Bankwell cottage is a very comfortable cottage for 6 people and is particularly popular with families. The cottage is very child friendly, with secure back and front gardens, open plan kitchen/ dining and lounge area, seating for 6 people and french doors to private rear garden. There are 3 large bedrooms, modern family bathroom and also a downstairs shower room/wc. The cottage is a tardis and is a lot larger inside than it looks, with off street parking for 1 vehicle and street parking for additional cars. We also allow up to 3 well behaved dogs, doggy treats and towels also available. The cottage is very well equipped with all mod cons and plenty of literature on local attractions and recommendations from previous visitors. I will also be at hand if you need any advice on local amenities or eateries. The cottage is just a 10 min walk into Settle where there is a Booths supermarket, a Tuesday market, cafes/pubs, train station, indoor pool. The market town of Skipton with its castle and daily market is 25 min away. There is plenty to do, with walking, cycling, sightseeing, shopping or just relax and ENJOY!! Family bathroom with bath and shower over and downstairs shower room with wc. Lounge diner with modern seating, gas fire, plasma tv, dvd, wifi, dining table for 6, french doors onto private garden with decking and seating for 6. Large retro American fridge freezer. Plenty of good quality crockery and kitchen utensils. 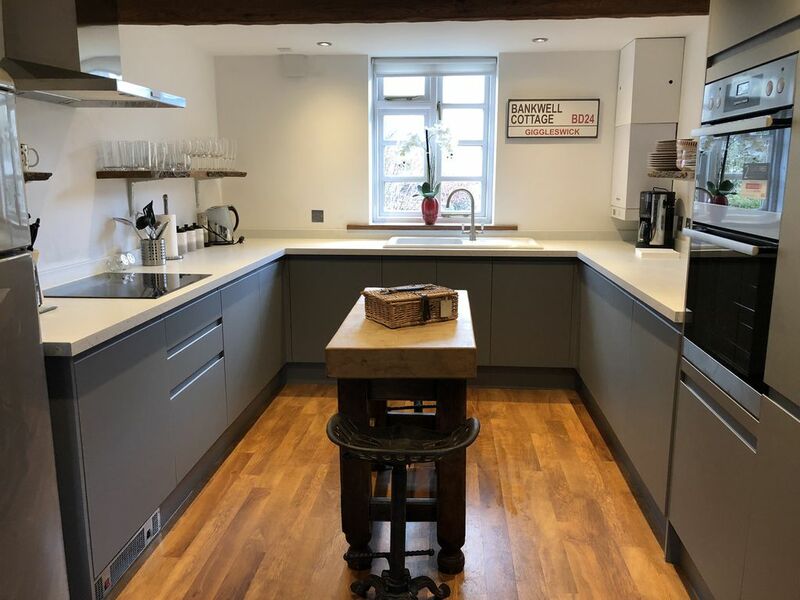 Modern kitchen with fitted units including electric cooker, dishwasher, washer/dryer, large retro fridge freezer, microwave. Settle Golf course is 10 minutes away and Bentham is 20 minutes. Notes on accommodation: We are very dog friendly and allow up to 3 dogs, (extra charges apply) Bankwell is a newly upgraded cottage and can be rented with it's sister cottage Sunnybeck, together they can accommodate 10. The cottage has 3 good sized bedrooms, 2 x doubles with built in wardrobes and a twin room with storage. There is a large bathroom with bath and shower, and NEW downstairs shower room/wc. The kitchen is well equipped with all appliances and large retro fridge/freezer. The cottage is located just a 5 min walk from the village and 10 min from Settle. There is a playground close by and Giggleswick school and it's famous chapel are walking distance. This cottage can be rented with its sister cottage Sunnybeck and together they can easily accommodate 10. Outside: The cottage has lovely rear and front gardens both with seating. There is off road parking for 1 vehicle and a bike store. Street parking close by. Cleaning / Towels / Linen / Maid service: All bedding/towels and a welcome hamper are provided for all bookings. Other: Downstairs additional shower room/wc, also secure bike and boot room. Half term break could not have been better. The warm cosy cottage had everything, wonderful well equipped kitchen, comfortable beds, cosy living area. Exceptionally clean and very nicely styled to give the cottage character. The welcome hamper was most welcome. We would recommend this cottage to everyone who would like to spend time in this beautiful part of the Dales. Thank you for your lovely review and for taking the time to share your experience. I hope you come and visit us again soon? We used our cottage to accommodate friends and family in sequence over the week. We catered for ourselves every night and were very impressed with all the resources offered in this very comfortable home from home. Carol was very warm and helpful and typified the people we met in the area. We enjoyed our walks along the river and into Settle as well as excursions further afield. The front garden provided sunbathing opportunities on a couple of evenings and indoors was commodious and relaxing when the light faded. Many thanks to Carol for our lovely stay and we would be delighted to visit the area again. Excellent, best dog friendly cottage we have stayed in. Lovely cottage and very dog friendly. Very helpful owner and gorgeous welcome hamper. Well equiped kitchen, comfortable lounge and excellent wifi for teenagers. Great location for visiting Settle and Yorkshire dales. Thank you for taking the time to review your stay at our Bankwell cottage. I am delighted you enjoyed your time there and I hope we see you again? The six of us were very comfortable in the well equipped cottage. Thank you Alison for your kind review and I hope we see you again? Cosy, well-equipped and comfortable cottage with good sized rooms. We loved it! The cottage is really well equipped, clean and nicely decorated. The three rooms are good sizes with comfortable beds and a large upstairs bathroom. The downstairs bathroom was an added bonus. We loved staying in the cottage and would recommend to others. Thank you Alice and I'm delighted you enjoyed your stay at Bankwell cottage! Please do come and see us again soon? This is a cyclists and walkers paradise. Morecambe Bay is a 45 min drive away and The Lake district is 1 hour. Leeds airport is 45 minutes away and Manchester airport is 1 hour. A car is very useful if you wish to explore the area, but for walkers or cyclists its not needed. The nearest town is Settle 10 minutes walk and Skipton is 25 minutes in the car. Harrogate or Leeds are an hour away and York is an hour and a half in the car. Settle has a Tuesday market selling local produce and the town also has a few good restaurants, pubs, and also plenty of cafes and tearooms. Giggleswick is a gorgeous village and a 5 min walk to 3 good pubs serving good food. Giggleswick school and its famous chapel are all close by. 25% is payable at booking and the balance + £100 refundable security deposit is payable 8 weeks before. We are very dog friendly and permit up to 3 dogs in our cottages. 1 dog is £25pw or £5pd and additional dogs are £15pw or £5 pd each dog.